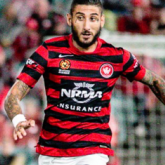 The Western Sydney Wanderers won a comprehensive 3-0 victory over an inspid Melbourne City tonight at the Homebush Olympic Stadium. It was a cold and blustery night at Homebush for the visit of Melbourne City. The game began with both teams trying to establish their midfield, the first major chance of the night coming in the 8th minute as City worked the ball wide for a cross that deflected into the 6 yard box, Brendan Hamill beating Florin Berenguer to knock the ball for a corner. Shortly after Shayon Harrison blasted a 20 yard left footed strike that Vedran Janjetovic turned away with a one handed save. Roly Bonevacia responded in the 11th minute for the Wanderers. Mitch Duke ran into the right channel, launched it back across into the penalty area, a flick on from Oriol Riera presented a chance for Bonevacia but he blazed over. Rashid Mahazi had a shot from a long way out in the 17th minute that was powerful but well wide. Kwame Yeboah had his first impact from a well worked Wanderers corner. Bonevacia laid the ball in along the by-line for Riera, his deft touch turned the ball backwards into the path of Yeboah who fired a fierce shot that looked like it was heading for the back of the net if not for a deflection from a City defender. The Wanderers headed to the penalty spot just after the half-hour mark. Yeboah tip-toed into the penalty area before having his feet kicked out from under him by Rostyn Griffiths, it was quickly cleared by VAR and up stepped Oriol Riera to take the shot. Despite Western Sydney's previous woes from the spot, Riera sent Galekovic the wrong way with a perfect penalty into the bottom corner for a 1-0 lead to the home side. The rest of the half was a scrappy back and forth affair, both sides copping yellow cards for strong challenges in the midfield. Only a couple of minutes into the second half Ritchie De Laet should have equalised for Melbourne City. An aimless ball into the middle managed to get past the entire Wanderers defence and fell to the fullback, he ran onto the ball and struck it well only to skim the edge of the far post. Against the run of play the Wanderers doubled their lead. Half-time substitute Abraham Majok and Raul Llorente combined down the left flank, playing a pair of neat passes that gave Llorente open pasture, he summed up the situation and fizzed a low pass across the top of the City penalty area that found Mitch Duke in acres of space after taking advantage of a good Riera run to draw away the City defence. Duke gently placed the ball with a side foot volley that Galekovic had no chance of stopping. With 10 minutes to play the two sides got into a bit of a melee after Raul Llorente cut down a City attacker as they refused to kick the ball out with Yeboah down hurt on the pitch. It didn't progress past the stage of push & shove and verbal confrontations, Mahazi joining Llorente in the referees notebook. The Wanderers closed out the game strongly, with several chances coming after through late sub Alexander Baumjohann although with the A-League's 5000th goal just begging to be scored the Wanderers had to settle for just a 3-0 win. 8 points adrift of Adelaide in 6th place, the win keeps the faint hopes of a finals position alive heading into the last handful of matches of the regular season. Western Sydney play Newcastle Jets in Newcastle on Saturday April 6th, in a clash that could determine the finals hopes of both sides. Should be a cracker of a game next up against the Jets. Competent win & performance without any bells & whistles, TBH don't think City would win tonight if they're still playing now, they looked a very jaded team apart from their N0 9 harrison who looked a handful, luckily Elrich was alive to him because Hamil decided to have one of his poorer outings tonight i thought. Second half was crying out for ABJ to come on much earlier than he did, the game was better for him being on the pitch and Majok's energy was great, and our goals were well taken. Bloody cold night out there, couldn't believe the guy down in front of me in shorts and Wanderers shirt, he will need a few Lemsips tommorow. We're a cold weather team. Chant of the night when De Lat came to the touch line for a throw, couple of likely lads on the fence "You're just a **** Western United" repeat. Good win on a very cold night. Elrich, Llorente and Vedran had a very good game . Hopefully Bonevacia is ok he (together with the rest) was hecked constantly. I don't think we are good enough to be in the finals but citeh are and we are not worse than them. We were pretty competent without being superlative, but jeezus Melchester were the dregs. Ok, they rattled the post once but aside from that they were all over the place like a mad man’s shît. Bastards weren’t scared off by the ref from some dirty sokkah either. Before this game I said it was hard to know what to expect from either us or them. Thankfully we turned up...they didn’t. Oh...füćk the cold & the almost total absence of any atmosphere at ANZ. Another one down! PS: Free Big Mack on Monday! That game was a great advertisement for a top 4, rather than a top 6. Did anyone else notice the way best Baccus celebrated our third goal. His steal off Kearyn was well executed & 2 touches later, Riera had put it in the onion bag. The longer I follow football the less I understand the game. Almost the same team, with the same make shift defense and midfield, that disappointed last round in Wellington did the polar opposite this time around. Discipline, structure, energy, physical presence and defending as a team for 90 minutes goes a long way, or so it seems. The coaching group somehow managed to fire up the team which is an achievement in itself. The players display energy and joy, as if they are playing for the title. Very happy for Raul who redeemed himself, to an extent at least. Good to know that Tate is not injured, but has been given a well deserved mental holiday by MB. Let's see if the Mariners can keep the glimmer of hope alive for us tomorrow, and let's see if we can leap frog the Jets next week. Man of the Match for me was the "Headcounter" (JC was reported to have turned water into wine) He turned the crowd of 4.000 into 7.000. Give that man an Abacus. One of the highlights from last nights game was the linkage on the left side between Lorente and Majok, also for me was the combination on the right side between Duke and Kamau. On a number of occasions when Duke picked up the ball in midfield he looked over his right shoulder expecting and getting Kamau's overlap and this coupled with Kamau's speed it worked well. Great performance, full of energy. Unfortunately it will be an 'if only the season went another few games'ending to the season. Too much to do from here even with a good run home. 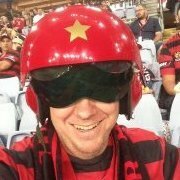 In contrast to the boring narrow shite that Sydney FC serve up, can't be too much longer in this league before that style of play is found out. Would rather watch a team with combinations out wide any day of the week. The end of this season feels already done. These feel like pre-season games almost. We have now dropped to 2nd worse on the attendance ladder. Averaging under 8.5k. Only Mariners worse. Even with the SOP factor that's embarrassing with the number of our members. And well deserved. Club and supporters have been treated with contempt by SOP, security and police. I hope that the club will never forget it. And then there's the S5 recruitment train wreck, the S6 three-coaches bonanza, and the "trains planes and automobiles" inspired S7. There comes a time when those without a masochistic streak in the fan base refuse to be tortured. But the end is near. 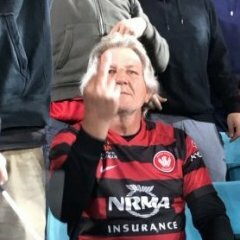 Only two more games in wsw's graveyard. Pressure and ego is a funny thing for professional footballers, in comes Duke and Yeboah and all of a sudden Riera has to perform at training and in games to get a gig, Russel and playing Kamau at fullback keeps Llorente out of the side and all of a sudden he has to play and train. ABJ started off like De Bruyne and then got lazy, had an injury and played some shockers, gets some time again and in that 10mins yesterday looked untouchable albeit City were terrible. I know they are playing for nothing but everyone wants to be on the park and remember still no Ziegler saw Elrich play a blinder in a spot he is not comfortable, Roly went off at half time, and we finally look like we can close out a game. Makes for an interesting off season, do we keep guys like Llorente, Roly, Riera or ABJ for next season, for me if ABJ wants to stay we keep him, Llorente can go and Riera happy either way. Pressure for spots is massive in any team, we finally have a bit of that . He counted legs, not heads. Watched the game this morning after recording it last night. Have to say that Melchester were better than I thought in the first 10-20 minutes, and no McLaren must've stung them. And in case anyone missed it, those flogs Slater & Speed did the call and before the game kicked off there was a dig at Babbel vis-a-vis not having won as many games as Gombau. Course they said jack **** about how well he has recruited since the beginning of the season, brought in a few youngsters who have stood bloody tall, and had his record sullied by idiot moments & dodgy ref calls. And Riera giving it to Galekovic after the penalty save on New Year's day. I liked how Llorente chopped down the City player when they didn't stop play after Yeboah was injured. You can debate whether it was smart or not, but showing that passion sticking up for your mates is admirable in my book. And this is why i never want cats folks. I don't disbelieve you, Marron. Can you find examples where they dont start with the PA system? And can a mob of us Aussies manage to get started to do that. PS My auto correct just changed your name to Matron...before I spotted it and changed it!